SCA is committed to delivering the country's best entertainment, music, sport, comedy and big events to Australians via our FM, AM and digital stations as well as podcast network, PodcastOne. Our unrivaled 84 stations reaching over 7 million Aussies are intrinsically linked to their local cities and towns, focusing on locally made content, news and events, giving back to communities through ongoing unique events as well as fundraising and support of community activities and issues. 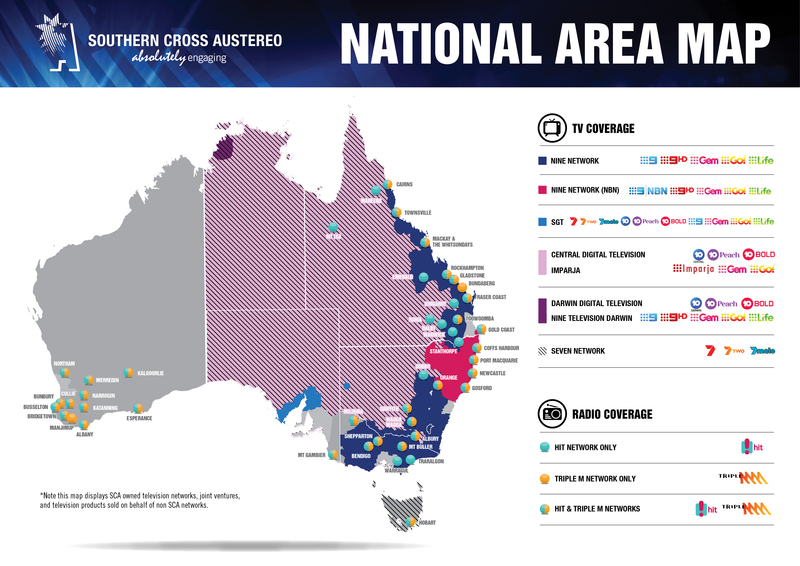 Southern Cross Austereo has the largest regional commercial Radio footprint in Australia with stations in all states separated into two targeted brands. Focusing on hit music, old-school favourites and RNB Fridays with hit shows at Breakfast and Drive, Hit entertains 4.5 million radio listeners every week, 8.6 million Facebook fans, 1.98 million Twitter followers and 1.26 million Instagram followers. Leading with audiences under 40 years of age, The Hit Network is the home of Australia’s biggest radio shows, biggest hits and biggest stars across it's FM and digital radio offering. After nearly 40 years, Triple M continues to be an iconic radio entertainment brand bringing the best music, sport, comedy and entertainment to predominantly male audiences around Australia on it's FM, AM and digital radio offering. With 3.5 million radio listeners each week, 2.89 million Facebook fans and 425,000 Twitter followers, the Network continues to grow audiences with its depth of talent centred around sporting heroes, comedians and music gurus. PodcastOne Australia is Australia's new podcast network. The network is an extension of PodcastOne US. PodcastOne is one of the world's largest advertiser - supported, on-demand digital audio network. With a 360-degree solution, including content creation, brand integration and distribution, PodcastOne sees more than 1.5 billion downloads annually, across 350 episodes produced weekly. In addition to our original Australian podcasts, you'll also find some of the biggest names and podcasts from the PodcastOne US network. All our podcasts are free to listen to and available wherever you are on the PodcastOne Australia app and website.